We just booked 2 one-way tickets to Hong Kong on February 6. There is no turning back now. Beyond Hong Kong, we have no idea where we're going or when. We have no plans and no agenda. 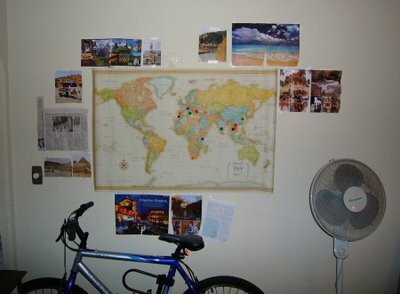 We put a world map on our wall a few months ago. We're slowly adding pictures of places we'd like to visit. Who knows if we'll get to all of them or none of them.